Tim Robinson is a guitarist based in London. He became interested in the music of Django Reinhardt as a teenager and has been playing and performing the style — now known as gypsy jazz, jazz manouche or gypsy swing — ever since. He has been lucky enough to play with many of the best players in the genre and has toured widely in the UK and Europe. In recent years, Tim has become known as a teacher of the style, mainly through the success of his YouTube channel and the free lessons on his website. In summer 2013, he was on the teaching staff at the world-renowned Django In June event in the USA. 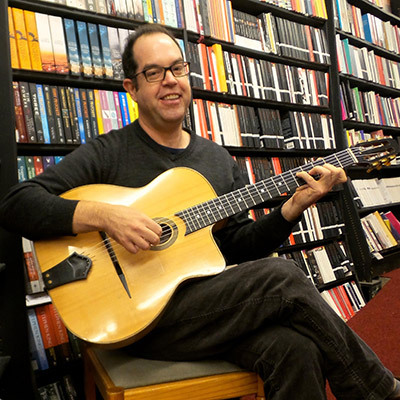 He is author of the “Gypsy Jazz Guitar” app available in Apple’s app store, and is a regular contributor to Robin Nolan’s “Gypsy Jazz Secrets” magazine.